If you were asked to sum up Urupukapuka Island in only one word, it would have to be – quite simply – “Wow”. As the largest of all the 140 beautiful islands in the Bay, you are so spoilt for choice when it comes to things to do on this island recreation reserve that you will find it difficult to only spend one day there. Luckily, you don’t have to! With three camp sites on the island to choose between, all of which charge extremely affordable rates, you are able to take your time and explore the island at your leisure. You can also use Urupukapuka as a base from which you can explore the other smaller islands dotted around the Bay. When you first arrive in this breathtaking haven of tranquillity, there is a good chance you will feel compelled to leave all traces of technology switched off at the bottom of your rucksack, and indulge in the simplicity of nature. However, for those of you who need to stay in contact with the outside world, or who simply cannot wait to upload your stunning photographs to show your friends, you will be pleased to know there is mobile coverage available on the island. Urupukapuka is abundant with world class beaches, where you can walk, eat a picnic and relax. There are countless spots around the island at which you can enjoy just about any water sport you can imagine, from safe swimming and snorkelling, to some of the more exhilarating ocean pursuits. You needn’t worry if you don’t have your own gear with you, either. 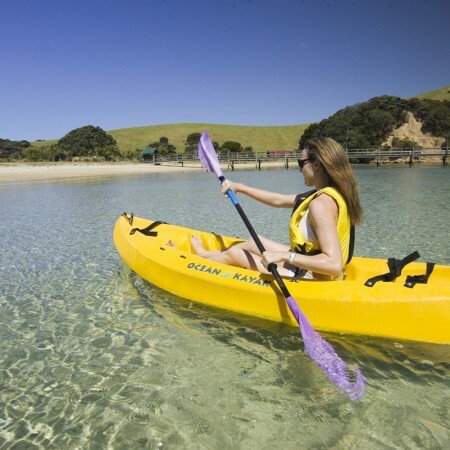 Hire a paddle board or kayak and explore the bays by water, or even book a half-day scuba diving experience at Otehei Bay from the booking office in Paihia, and visit the magical reefs and underwater world of the Bay. There are just as many, if not more, on-land activities to experience on Urupukapuka Island. Otehei Bay, the hub of the island, is an essential place to visit, and not only because of its breathtaking scenery and spectacular, safe-swimming beach. If you travel to the island on the ferry, which leaves Paihia and Russell at regular intervals throughout each day, this is the first place you will see. You can book a 6 hour Māori experience on Urupukapuka Island and be greeted at Otehei Bay by a friendly Pōwhiri and waiata, before enjoying cultural workshops in flax weaving, Māori remedies and Poi, a guided walk, and delicious traditional Māori food. The Island Conservation Centre at Otehei Bay is another must-see attraction, and offers free entry to everybody. Here you can learn about the island’s fascinating prehistoric and colonial history, as well as the ground-breaking work of Project Island Song and DOC to restore native bird life to the recreation reserve. Urupukapuka Island is packed with fantastic walking tracks, ranging from 1 hour strolls to 5 hour hikes, so whatever your stamina level you will find something for you. The most notable of these is the 7.3km Urupukapuka Island Archaeological Walk. This track, designed to be walked in a clockwise direction, can be accessed from most of the larger beaches on the island, and if a 5 hour trek is a bit too much for you, it can be broken down into two shorter 2.5 hour walks. As well as boasting some of the most spectacular panoramic views imaginable, you will be taken past many of the dozens of pristinely preserved archaeological sites on the island, some of which may be up to 1000 years old. From prehistoric Māori pa, villages, gardens, and food storage, right up to early 20th Century buildings used by famous author Zane Grey, there are countless historic sites to explore on Urupukapuka Island. If all that sounds like thirsty work you can drop in at the fully licensed family friendly café in Otehei Bay, and enjoy great food and beverages, or alternatively book yourself onto the Otehei Bay Dining Ferry and enjoy exquisite local cuisine on the water. Urupukapuka Island is arguably one of the most fascinating and beautiful islands of New Zealand, and an incredible way to spend a few hours or days of your life. We very much hope you enjoy your time there.